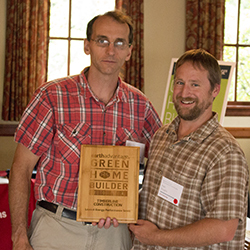 Matt Douglas received the award on behalf of Timberline Construction of Bend. Constructing the Desert Rain Home has resulted in many accolades for our construction company, including the 2014 Earth Advantage Green Home Builder of the Year Award for the lowest EPS (energy performance score). This was a new award for 2014, conceived to help promote tighter construction – and this home had an EPS of ZERO, the lowest score a home can get! Home from all over Oregon and Washington were considered for these Awards, so it feels extra special to bring this home to Central Oregon. This project, based near downtown Bend, Oregon has received multiple awards for pushing the concept green building to it’s max and is striving to meet the Living Building Challenge. Green Building is important to us, and we often tell our clients that green can be accessible, no matter the budget. It’s much more than reclaimed materials and smartly designed appliances. Including a tight building envelope – the very structure of your home – is the most basic and important step you can take toward a sustainable home. See the 2014 winners here.